Posted on 21. Jun, 2010 by Corey in All, Dayton Dragons Baseball, General Baseball. In a recent at bat at Fifth Third Field, Dragons outfielder Alex Oliveras tried to turn on an inside pitch. The ball was fouled off, but the result was a broken bat, sending Oliveras to the bat rack for a new piece of wood. Following the game, Oliveras brought his broken bat to my office to exchange for a new piece of lumber. I located the model that he uses, an all-black Louisville Slugger Model C271 33.5 inch bat. Oliveras thanked me and returned to his locker in the clubhouse. Wanting to make the handle feel more comfortable, Oliveras typically tapes the knobs of his bat with medical tape, a common practice among players. 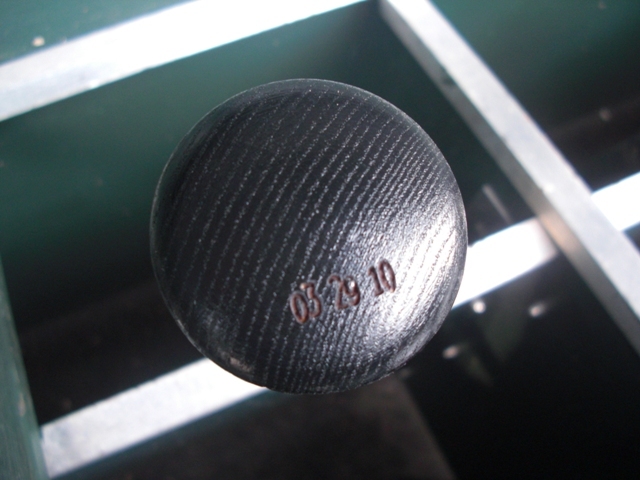 While placing the tape on the new bat, Oliveras noticed the “born on date” stamped on the end of the bat, corresponding to when the bat was produced by Louisville Slugger. The stamp read, March 29, 2010. This date has significant meaning to Oliveras, since it is his birthday. Thinking it was a weird, but great thing, Oliveras returned to my office to share with me the news, and also check if the entire box of that model was like that. I quickly told him that it was good luck, and that he should go hit a bomb with that bat because it would make a great story. Having forgot all about it, Oliveras stepped to the plate the next night in Midland, Michigan facing the Great Lakes Loons. Clearing his mind and focusing on having a good at bat, Oliveras picked out a pitch he liked, and deposited it over the right field fence. Oliveras went on to say that there had to be a little luck in that exact shipment coming to him in Dayton and he hopes to hit plenty more home runs with the bats that share his birthday. Gracias!! Glad you liked it…Alex is a great kid and enjoy having him with me in Dayton..come visit por favor! !